durching these days of anticipation. Mum, what was it like when I was born? and put you on my breast. From whose clusters the whole creation is refreshed? 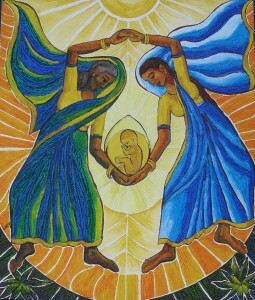 Mary and Elizabeth rejoice and dance singing the Magnificat. 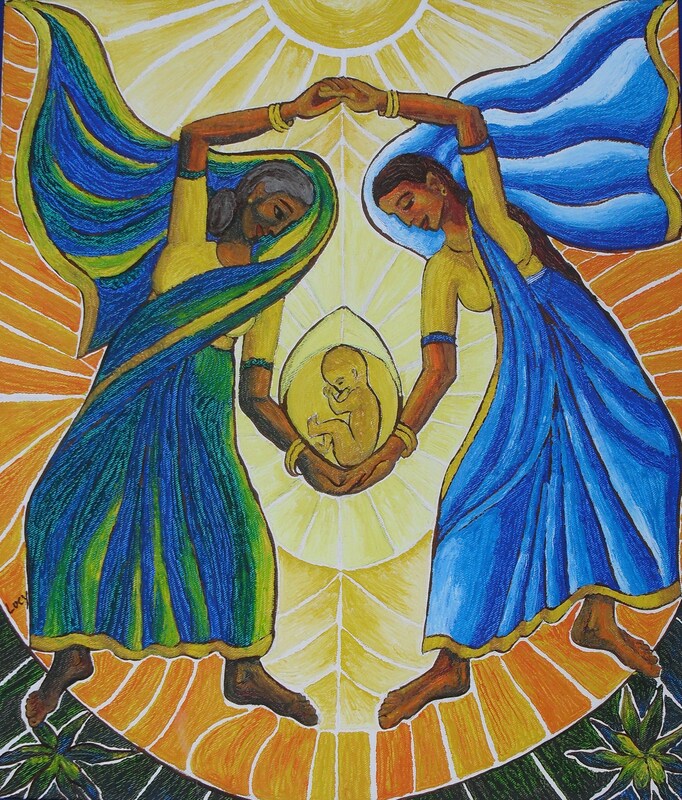 Mary and Elizabeth are in the yellow orange form depicting them to BE with the child, and full of Grace and Light. In the child and due to the child this Glorious Visitation has taken place, the child brings them Joy, Hope, Light and Life. A Fantasiereise—travelling by imagine back to the roots of your birth. I invite you to close your eyes and to listen to my voice and to try to see with your inner eyes. of my mother receive me. Sick Child In The Womb – Forgive Us! and felt you in the womb. Your life would be full of pain and hardship. of your parents and your brothers and sisters. may take you in her motherly womb! Mother of Idiots and Geniuses. Cultivating and harvesting in the scorching heat ot them. Journeying home to feed the family. You see my tears, you hear my sighs. becoming a child of grief. You didn`t look in our sparkling eyes.